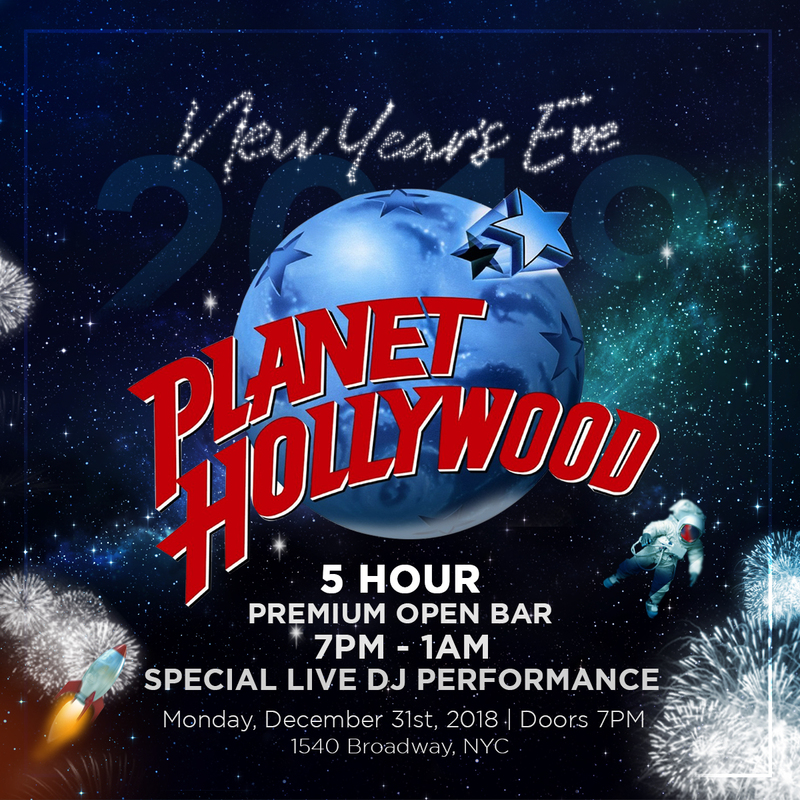 Party in glittering Hollywood style this New Year’s Eve at Planet Hollywood, New York City, Times Square’s famed social and nightlife venue. The bright lights of Times Square combine with Hollywood chic this New Year’s at Planet Hollywood and its upscale Italian eatery, Bucca di Beppo, where New York’s marvelous party crowd of all ages will gather to revel in deluxe amenities and high-energy ambiance. Planet Hollywood’s bash is sure to be the biggest hit this NYE. NYC’s star NYE event is taking place at Times Square’s famous Planet Hollywood, and you’re invited. Taking place in the landmark themed venue and its renowned eatery, Bucca di Beppo, Planet Hollywood’s NYE event will have you partying like a celebrity, no matter your age. Get the blockbuster party experience at Planet Hollywood, where a 5 hour premium open bar - with fancifully film-themed drinks - will keep guests over 21 spirited all night. Celebrants of all ages will be getting down on the dance floor as a live DJ spins a crowd-pleasing soundtrack of Top 40, Hip Hop, House, Mash Ups, as well as family-friendly tunes and oldies. NYE revelers looking for a more intimate experience can head to the famed Buca di Beppo, where guests over 21 will also be able to enjoy a 5 hour premium open bar while everyone can delight in a selection of the restaurant’s acclaimed menu. No matter which venue you opt for, at midnight, you’ll be ringing in the New Year in splendid style as you tune into a live broadcast of the NYE Times Square Ball Drop on multiple large screen TVs, and count down live with the whole crowd. Guests over 21 will also be able to delight in a classic champagne toast, compliments of the host. Located in the epicenter of NYC’s NYE celebration, Planet Hollywood is a Times Square icon. The celebrated venue is animated by the dazzling energy of the area and has been a destination to catch the fabulousness of Hollywood celebrities and cool Americana, right in the heart of NYC. The renowned venue has hosted parties for mega-celebrities like Jennifer Lopez, Robert Pattinson, Jason Stathem and many more. The glam-infused interior boasts lavish red booths, red zebra carpeting and is divided into spaces inspired by NYC’s landmarks like Times Square, Hudson, Central Park. Head to the world-famous Buca di Beppo and guests will find an intimately upscale eatery marked by cozy booth seatings, vintage family photos of Italian-American icons like Sophia Loren and Jo DiMaggio, and an elegantly classic Italian-style ambiance. Whether you opt for Planet Hollywood’s headlining party energy or Buca Di Beppo’s family-friendly atmosphere, this New Year’s Eve is sure to be an A-list night at Planet Hollywood’s bigger-than-life bash.